Think of all of the best-case scenarios you hope to achieve with your direct mail: recipients notice your mail; spend time reading your mail; remember your brand; notice and consider your offers; and most importantly, they take action. Now, if only there was some way to…oh, wait! There is: LARGE FORMAT MAIL! The larger format itself isn’t what ‘makes the sale,’ that honor belongs to the fabulous offers you use. The large format, though is a major component in getting your audience to actually notice, spend time with, and remember your offer. So, whether you’re going with a large, flat piece to prospects, or you’re mailing your customers a large piece folded down to add bulk, interest, and interaction, you are making the smart choice to use at least one large format mail piece this year. Before you equate bigger formats with bigger costs, consider the facts. Prospects are about 15% more likely to respond* to an oversized direct mail piece if they are unfamiliar with your brand. Spectrum designs your mail pieces for the 3, 10, and 30-second readers. Even fractions of a second added to the initial interaction with your mail means a better chance your audience will convert from a 3-second reader to a 10 and eventually a 30-second reader. More real estate means more understandable messaging. When your content has room to breathe, it is easier for readers to digest the content. And because they are using multiple senses with your mail piece, the recall is at 75% compared to only 44% with digital messages. In fact, the Canada Post 2015 report found that your mail takes 21% less cognitive effort to understand and recall than digital messaging. Large format mail is easier to understand, more memorable, and provides a more positive interaction. On a large, flat piece to prospects, your offers can be larger and more noticeable – if you’re using the right offers, this means you’re increasing the likelihood of response. If you’re mailing your customer list, large, flat pieces can be more expensive in postage, so you can overcome the added postage by folding your piece. Don’t worry, though. You can direct your audience to the offers “inside” your mail piece, and, like the milk at the grocery store, get your audience to go through your great products and services before they get to the coupons/gift cards as they unfold your piece. There are inexpensive, small mailers out there which can seem attractive for those business owners like you, who care about the bottom line. Understandable. But, when you consider the effectiveness of your advertising campaigns, a little extra cost that amplifies your offers, engages your audience and enables larger response is easily offset. 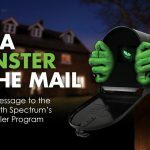 Call your Spectrum Representative today and ask about some of our larger, more engaging direct mail formats!